Weeknight dinners can be hectic for working parents with children. Preparing a couple of extra dishes over the weekend eases the stress. You just pop them into the oven on a busy night for an instant meal. Slow-cookers also save time. With a little advance preparation, you can come home to a home-cooked meal any night of the week. 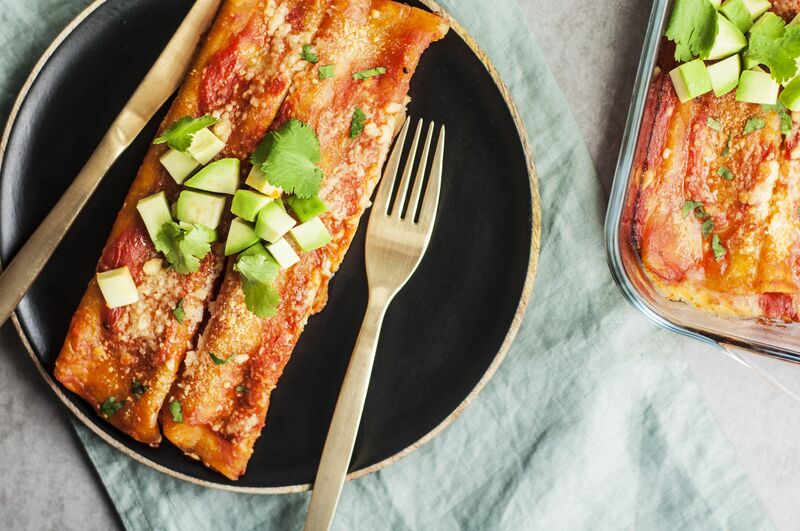 Highly customizable easy enchiladas make for an easy weeknight meal paired with a simple salad. Start with this basic recipe for cheese-stuffed enchiladas, then put your own spin on it by varying the sauce, adding shredded meat or trying different types of cheese. For make-ahead convenience, assemble the dish the night before or in the morning if time allows, cover it with foil and store it in the fridge until you're ready to cook. This family favorite lets you throw all of the ingredients into your slow-cooker, which you can store in the fridge for up to 24 hours. When serving day arrives, take the crock pot out of the refrigerator in the morning, put it in the warming unit and set it to low. By the time dinner rolls around, you have a steaming pot of delicious ​chile colorado. Heat some tortillas, and your meal is ready to go. This chicken chile verde is a crowd pleaser comes together in just a few steps, but it does require some tending, so it makes a better weekend project. You can store it in the refrigerator for dinner later in the week, or freeze it in serving-size portions for longer storage. Serve it with a steaming stack of flour tortillas, rice and an array of toppings such as shredded cheese, chopped onions, chopped cilantro and lime slices.